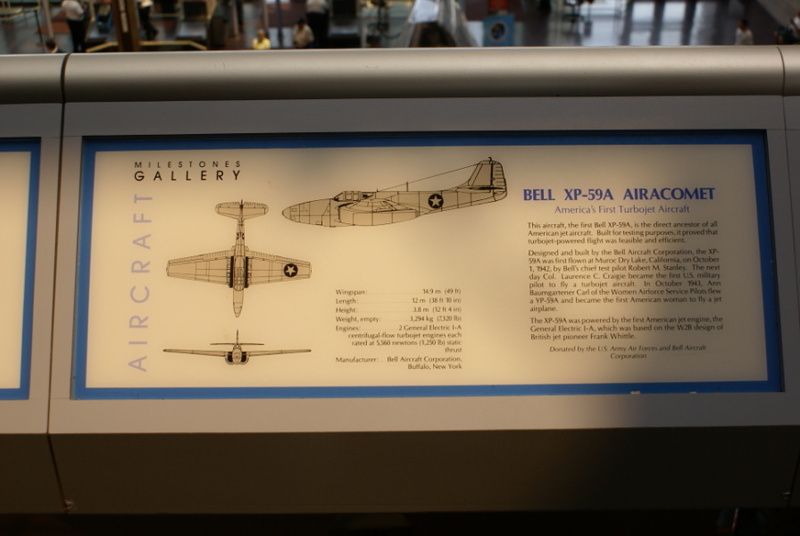 This aircraft, the first Bell XP-59A, is the direct ancestor of all American jet aircraft. Built for testing purposes, it proved that turbojet-powered flight was feasible and efficient. Designed and built by the Bell Aircraft Corporation, the XP-59A was first flown at Muroc Dry Lake, California, on October 1, 1942, by Bell's chief test pilot Robert M. Stanley. The next day Col. Laurence C. Craigie became the first U.S. military pilot to fly a turbojet aircraft. In October 1943, Ann Baumgartener Carl of the Women Airforce Service Pilots flew a YP-59A and became the first American woman to fly a jet airplane. The XP-59A was powered by the first American jet engine, the General Electric I-A, which was based on the W2B design of British jet pioneer Frank Whittle. The XP-59A Airacomet is NASM catalog #A19450016000.